Happy New Year to you all! Last week my family sat down and discussed how we could be healthier and happier for the new year. One way that the kids smartly guessed was to change our eating habits. We all agreed that we needed to find snacks that were better for our bodies. 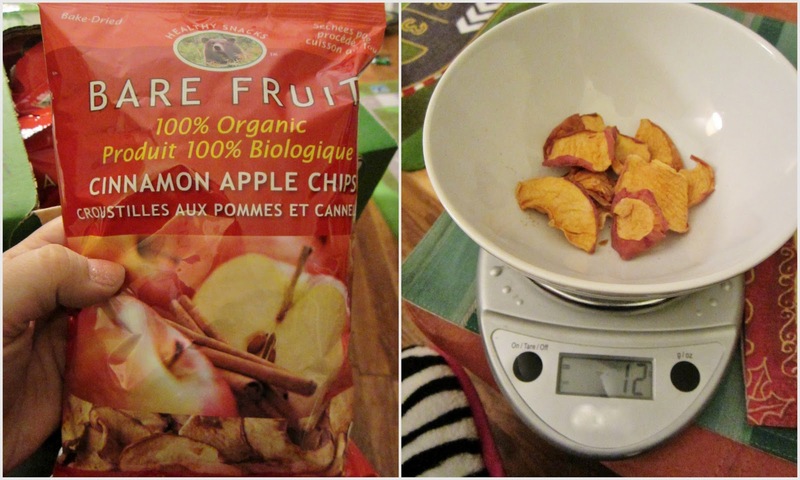 Bare Fruit makes a 100% organic cinnamon apple chip. This bake-dried fruit contains nothing extra, no preservatives and no added sugar or sweeteners. It's just simply natural. 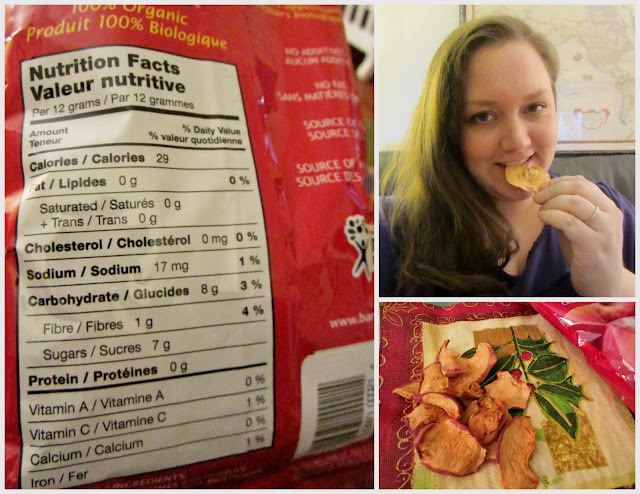 The ingredients on our cinnamon apple chips bag literally read: 100% organic apples and 100% organic cinnamon. Apples do have a good amount of fiber and that aids in digestion which can help to prevent colon cancer. Apples are pretty low in vitamin C but they are high in antioxidants which is great for your body. These sweet fruit are great for weightloss, reducing your cholesterol and possibly for fighting heart disease. You can't go wrong with apples! The bag says that 1 serving is 12 grams so I weighed out 12 grams and it was a nice handful sized pile. Plenty enough to satisfy my snack-time cravings. At only 29 calories and zero fat per serving plus 8 good for you carbs these babies are amazing! There is nothing to feel shameful about when you are enjoying a handful or even two. The flavor sort of caught me off guard at first. I was really expecting a sweet flavor rich with cinnamon. The flavor was tart with a light sweetness and a very light amount of cinnamon. My jaw actually tingled and I know I made a slight pucker at that first bite. I know the kids will enjoy this since they love tart or sour candies. Once I'd eaten my third apple chip I was not going stop until I had finished my entire pile. The flavor grows on you and gets better as you go. The crunch is perfect and the bake-dried apple flesh actually melts in your mouth. The apple skins were the perfect thickness, they also sort of melt. The only part that I was leery about was the core. The apples are sliced all the way through and they do include it all in the bag. Biting into the core section was no different than the rest and I actually didn't notice much difference next to a slice without the core. These are a delicious and healthy snack, you have just got to try! Here's to a healthier & happier you in 2013! Would you like to have the chance to win some 100% Organic Bare Fruit Apple Chips? Enter by clicking or scanning the QR code at the bottom of my post! Thank you for entering the Bare Fruit giveaway ($25 ARV) which ends 1/14 at midnight EST. The winner will be chosen Tuesday, January 15 and announced on the Bare Fruit Facebook page and Mama Nibbles blog. Why wait? Order your undressed fruit by clicking here. Giveaway is over, thanks to everybody that entered! 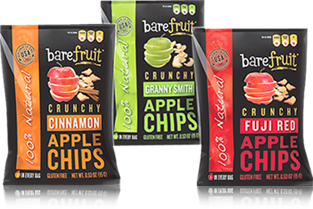 The winner was Terri from OH and they will be getting a whole case of apple chips delivered to their doorstep very soon. Congrats! "Winner" must be a Fan of Bare Fruit at the time of drawing. “Prize” valued at $25. “Winner” will be notified via email by Mama Nibbles and be given an option of product flavors. The contest begins Wednesday, January 2 and ends Monday, January 14 at 11:59pm. Mama Nibbles was provided with a case of apple chips as a gift to help facilitate her review. All opinions are her own. This promotion is in no way sponsored, endorsed or administered by, or associated with, Facebook. You are providing your information to Bare Fruit Snacks and not to Facebook. The information you provide will only be used to contact you.